So here at Larsson UK we’re business to business trade only motorcycle parts supplier. We bring in parts from all over the world and we distribute them to big franchise dealers as well as small one man workshops all over the UK and Ireland. Most of our product comes in from Europe, but we also source product from all over the world. The sort of product range we carry includes service parts, consumables, accessories, more bespoke items like engine parts; such as pistons, conrods and crankshafts. So the issue that we were facing is that we basically ran out of room in our current warehouse. As our customer base increased our orders and volume of sales increased. And we basically couldn’t always fulfil the customers’ orders right away. So what we did we took on the unit next door to our building, basically doubling the floor space. And then what we looked to do was have a full mezzanine, covering the entire building do that we could have the ground floor purely for stock and fast moving picking items and then we’d have the upper floor for storage and bulk storage, where we could have pallets for replen and basically make our whole operation a lot more efficient. 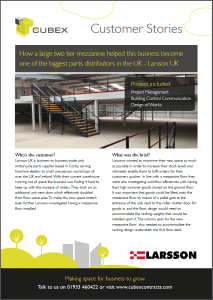 So when we were looking to design our mezzanine we approached several different companies. We decided to go with Cubex because we needed someone to manage the project right from the beginning all the way through to the end. This included planning, achieving building regulation standards and actually the full installation right to the handover. 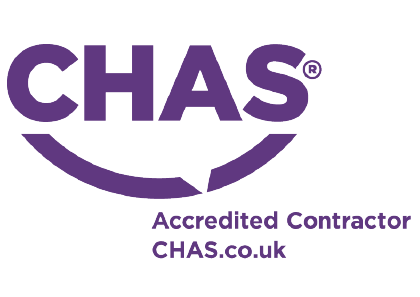 We offer a full turnkey service and can take on the responsibility as principal contractor on project and we actually prefer to do that. Cubex were very accommodating, we had some very specific requirements, for example we wanted to have as fewer number of posts on the ground floor as possible, we also wanted to have a 2-tiered mezzanine, which wasn’t the normal standard to go down. Cubex were able to accommodate us and the final result we are very happy with. One of the key points with this project was the site conditions. There were issues with the subsoil bearing pressure, we got around that problem by including bigger base plates on the columns. This is particularly important with a 2-tiered structure because you’ve got twice the amount of load coming down through the structure that you would normally have. One of the alternatives for this project would have been to install a rack-supported structure, but we elected for a free-standing mezzanine structure because it offers several benefits over a rack-supported structure. The key ones being flexibility, you can use it for racks or you can use it for pallet storage. The other key consideration here was fire protection. You can easily fire-protect a mezzanine structure; you can’t really fire-protect a rack supported structure. An important point with a 2-tiered mezzanine structure is the travel distance that you’re allowed for means-of-escape. Building regulations requires you to be able to exit the floor within a certain linear meterage and of course with a 2-tiered structure, the greater amount of floor area requires an adequate means-of-escape. Which is why on this project you see 2 staircases off of each level. So the mezzanine has achieved for us basically we are now able to stay in this building, probably for another 5 years as a minimum, probably up to 10 years. Long-term moving forward we are now able to fulfil our customers’ demands almost immediately, we can carry a much higher level of stock and it helps us become one of the biggest motorcycle parts distributors in the UK.